I was going to present a Doctor Who Festival ‘Rap’ but thought it would probably end up being pretty lame. Rob Lloyd on stage at the start of the day. 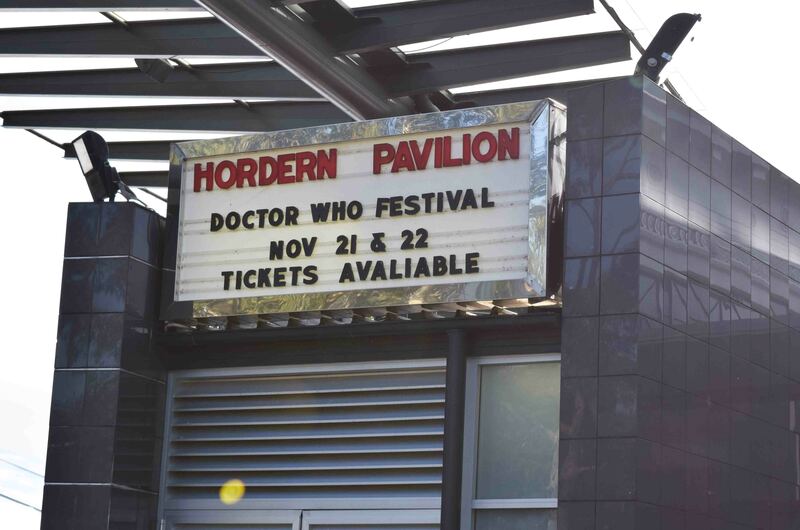 The reason I headed to Sydney was solely to attend this amazing event at the Hodern Pavilion in the same precinct as the Sydney Cricket Ground. I did end up with another day in Sydney, but if it wasn’t for this I wouldn’t have gone at all let alone stayed overnight at Melbourne Airport and caught a 6am flight to Sydney. I wasn’t the only one, there were a number of people at my hotel that were going there too, some from interstate and many from reginal parts of New South Wales. Not to mention the fact that all the guests had come from the United Kingdom to be at the event, and add on top of that has any character travelled more in his tele-visual history than the Doctor? Short and long answer – nup! Line outside at 9am waiting to go in! Taking a taxi to the Hodern Pavilion revealed that either taxi drivers in Sydney don’t know where it is, or that a fare of only $20 is not worth their while. Nevertheless, I got one in the end, it was the third I tried, and thanks to a very smooth and on time morning, I managed to arrive at the venue at 8.50am, ten minutes before they were due to open the doors. We’d even checked into the hotel, nice of them to let us into a room so early in the day! 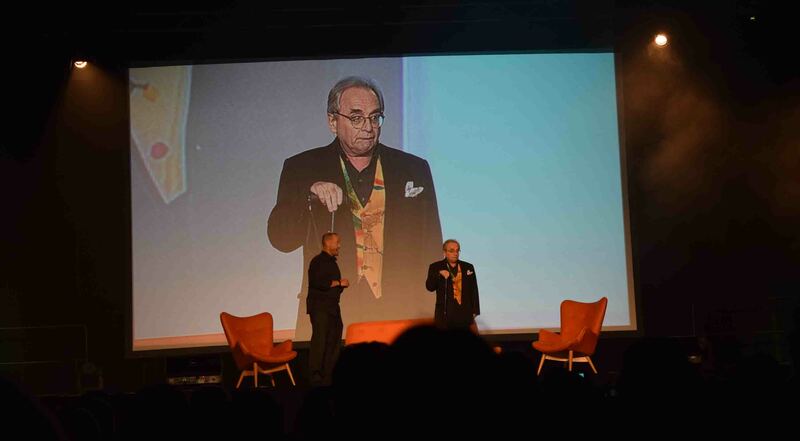 The event was well run, with excellent hosts in the forms of Rob Lloyd (friend of the blog and a highly talented fellow indeed), David Inness and the rather less excellent Adam Spencer in the main arena interviewing Peter Capaldi, Stephen Moffatt, Ingrid Oliver and Sylvester McCoy whilst texting at the same time. Or possibly sexting, it was hard to see from 15 rows back. Festival goers were divided into two groups that were supposedly allowed in different areas at different times. In reality they only cared if you were going into the main arena where the mega-stars were. There were interviews on different stages with different people at different times. Some of it was geared towards the youngsters (unlike the last couple of seasons of the actual show!) but fans of all ages had plenty to occupy themselves with for a full day. I was there until 6pm, so that was the full day. 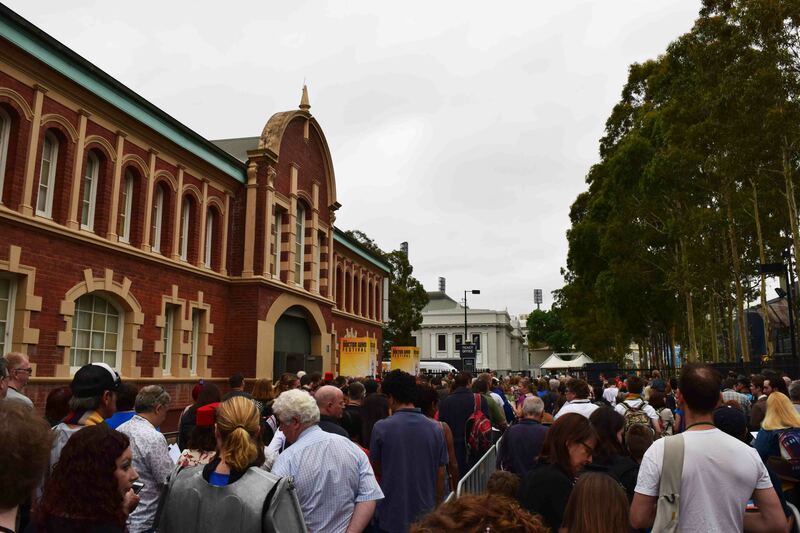 The line to the festival as I arrived. Dan Starky, who plays Strax, teaching some younguns how to walk like a monster. There were many monster costumes and non-monster costumes on display as well, although the merchandise on offer was rather limited. I’d signed up when I first got the email for photos with Peter Capaldi and Billie Piper. 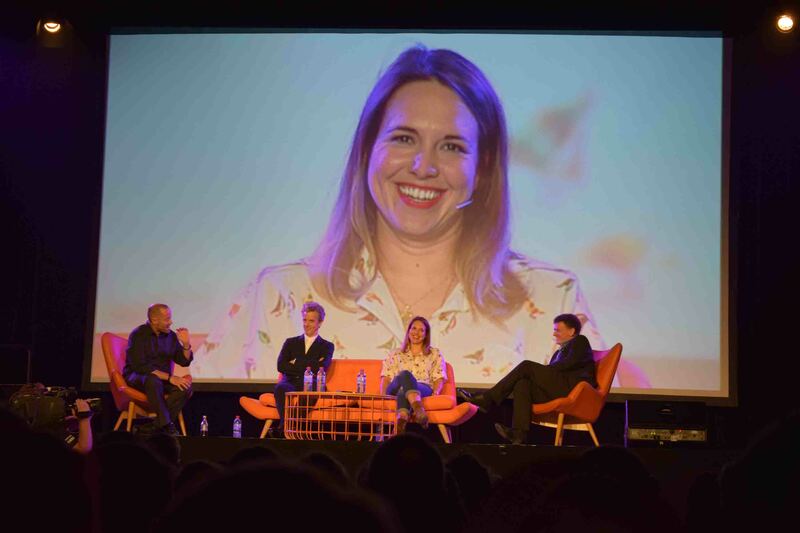 In the end, Piper pulled out and was replaced by Ingrid Oliver who has been playing the part of ‘Osgood’ in the recent series of Doctor Who. I decided the trip was already costly me far too much so I decided to take a refund and not get the replacement photo. Perhaps I slightly regret the choice now. 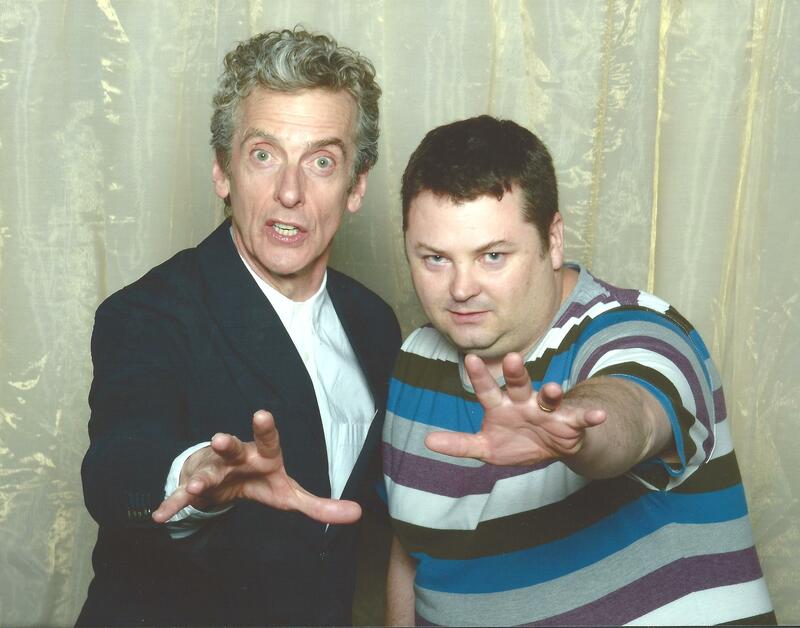 It’s Peter Capaldi, and me! It’s the first and only time I’ve paid to had my photo taken with a star. And although I am desperately disappointed in just how much weight I’ve gained this year and how much it shows in the photograph (not to mention the lack of sleep that is evident around my eyes) I’m still very glad I got the thing, and the 12 seconds I had with Peter proved to me that he is a generous giving man, and utterly brilliant. 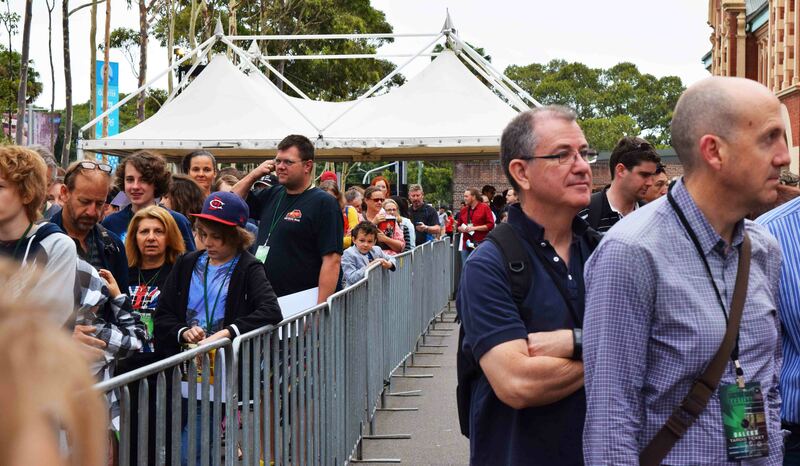 Honestly, watching him as I queued for 30 minutes for the photo as he greeted and posed with so many people (estimates at 360 in a day over two sessions) I saw that his energy didn’t drop even for a millisecond. 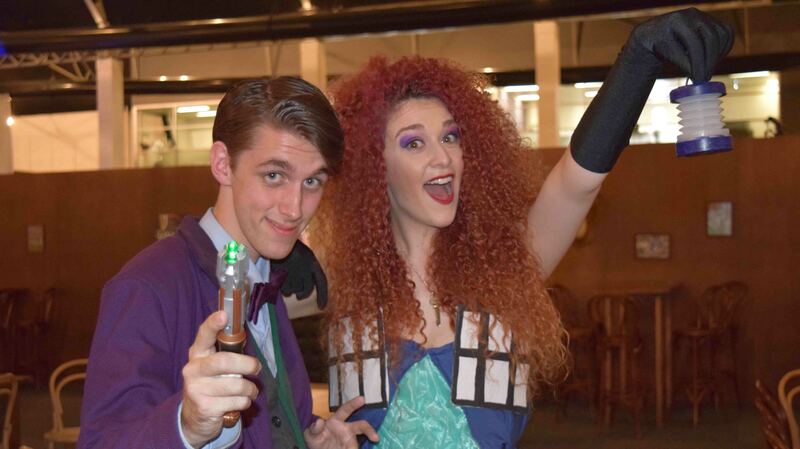 A couple of friendly cosplayers. Then I headed to the pub quiz section and of course won in my team of people I’d never met and may never meet again. Then I saw the rather disappointing SFX show whilst the next edition of the quiz (one every hour) saw a team comprised of Mark Gatiss, Stephen Moffat and Peter Capaldi! Yes. I felt miffed I’d missed it by one session. They came third. 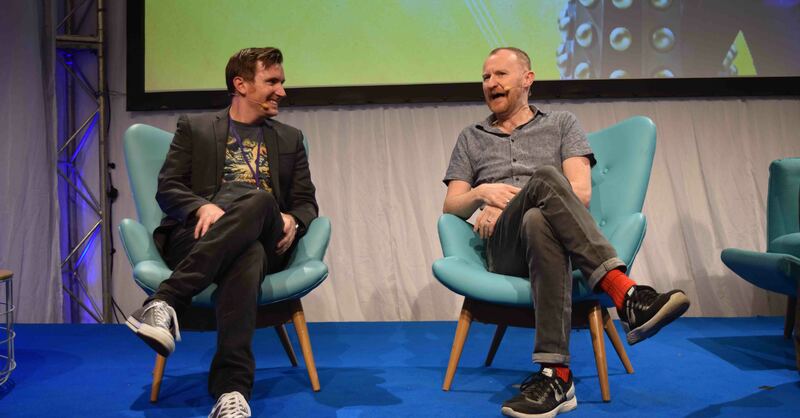 Mark Gatiss is interviewed by Rob Lloyd. Finally, as my energy fell away, I saw Rob Lloyd interview the very entertaining Mark Gatiss (insert cynical comment here about how this compares to his stories lol. Bar ‘The Crimson Horror’, love that one). The day was done, but back at the hotel I settled in to watch episode ten of the current season, ‘Face the Raven’. Alas, and don’t tell anybody, I fell asleep halfway through! Nothing to do with the episode which I thought was rather good on re-watching, but I was just so tired. Three hours sleep, a flight, and everything else that had occurred through the day at fault say I! 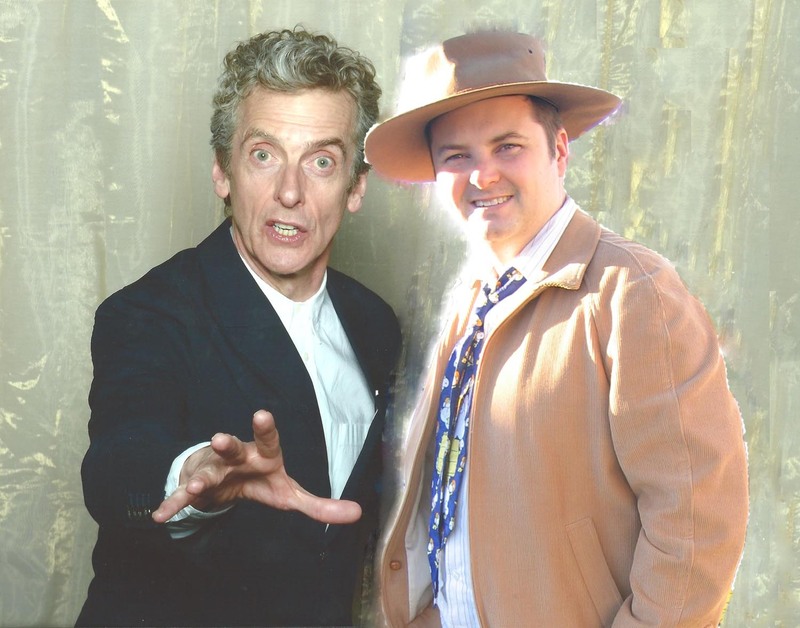 I felt so bad about how fat I look next to Peter Capaldi, I replaced myself with a picture from 2007. The thing cost $198 for entrance, $60 for the photo. That’s pretty outrageous. But hey there was a lot to fly out to Australia from the UK, and I don’t just mean the stars. It was a little too sanitised in some ways, there was a conscious effort to get everyone to have exactly the same experience. 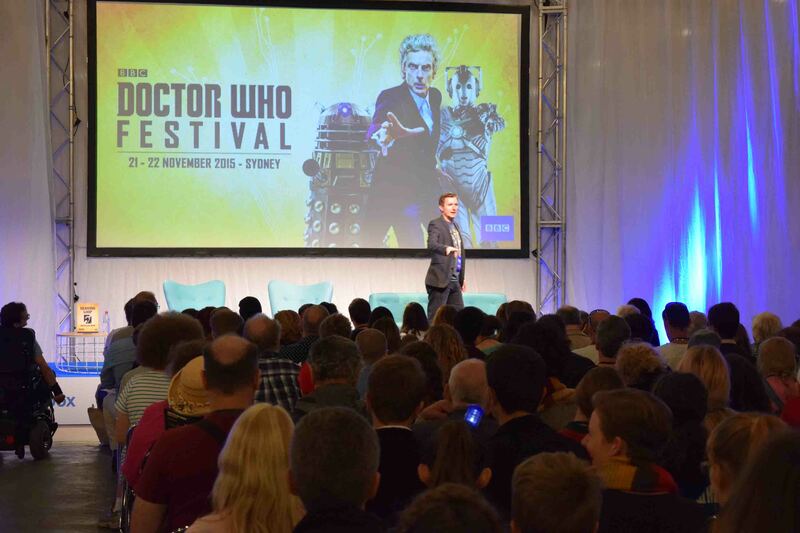 But it’s very rare that the current actor in the role of the Doctor comes to Australia, and in the end, it was worth it. The venue really needed more food options though. I would have thought for 200 bucks they might have thrown in a complimentary serve of fish fingers and custard! So, there’s the day as it unfolded. Thanks for reading. Have you ever gone a long way to meet someone? Someone famous? What was that like? May the Journey Never End!